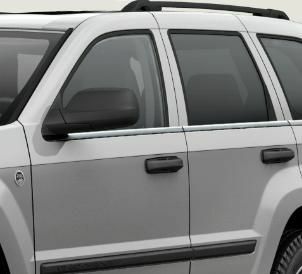 Dress up your Jeep Grand Cherokee with a set of WK chrome window moldings. They replace the black rubber window moldings for a brighter look. The set includes four moldings for the front and rear doors. The rear quarter glass molding cannot be replaced without replacing the glass assembly. Choose from two options for the front doors. The short chrome front door moldings stop at the base of the mirror. The long front door moldings run underneath the mirror. Compare to the moldings currently on your Grand Cherokee.